Savor these Easy Beef Kabobs. 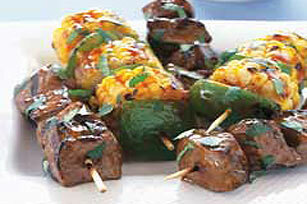 Barbecue sauce and chopped cilantro lend a sweet, fresh taste to Easy Beef Kabobs threaded with steak, corn and peppers. Thread steak evenly onto 4 skewers. Thread vegetable chunks on 4 additional skewers. Place in shallow glass dish. Mix barbecue sauce and cilantro. Pour half the sauce mixture over kabobs; cover and refrigerate at least 4 hours to marinate. Refrigerate remaining sauce mixture for serving with kabobs. Heat grill to medium heat. Remove steak kabobs from marinade; discard marinade. Grill 5 min. ; turn kabobs over. Add vegetable kabobs to grill; grill 5 to 6 min. or until steak is done and vegetables are crisp-tender. Warm reserved sauce mixture; serve with kabobs. For more even cooking on the grill, microwave the corn on HIGH for 2 to 3 min. before threading onto skewers to grill. Substitute KRAFT Sweet Honey Barbecue Sauce for the KRAFT Original Barbecue Sauce and grated peel of 1 lime for the cilantro. Substitute 1 lb. boneless pork loin; 1 large onion, cut into wedges and 2 cups fresh pineapple chunks for the steak, corn and peppers.